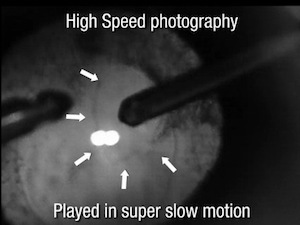 When there is a brown cataract virtually the cortex amount is reduced to nothing. If you do not master the chopping technique the nightmare is behind the corner. By using less aggressive techniques such us stop & chop or at least quadrants this patient would had his capsule. A little more humility on our part could save many eyes of our patients... but we would have less video!